Aegis Shield Mobile is available for iPhone and Android. Does your supplement contain banned substances? Aegis Shield® helps keep athletes clean and in the game by providing an extensive, up-to-date database of products and supplements. Find out more about how to use our website and mobile apps. Interested? 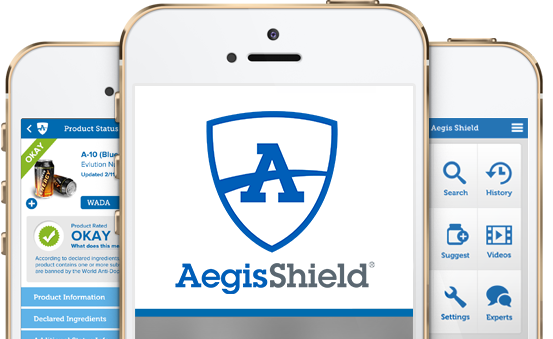 Sign up now and start using Aegis Shield on desktop, tablet, and mobile devices. Get in touch with Aegis Shield. No worries. Send us a few details about your product and we’ll review it for possible inclusion in Aegis Shield®. In our constant efforts to provide you a superior service, we need your feedback. Tell us what you like and what we can do better.